Batteries, magnets, and the Internet of Things are the hot new trends in wireless security cameras. Like the Homeboy camera I wrote about a couple weeks back, Netgear’s new Arlo cameras eliminate the need for power cords, stick to their mounts with the aid of strong magnets, and can trigger other networked devices, such as lights. Unlike Homeboy, Arlo records its video clips in 720p resolution. I haven’t laid hands on Arlo, yet—it won’t ship until mid January—so I can’t say how much better its video looks. And that’s not the only difference between the two devices. I’ll reserve final judgment until both products are in reviewable form (Homeboy’s hardware was finished, but its client software was still in beta when I previewed it). 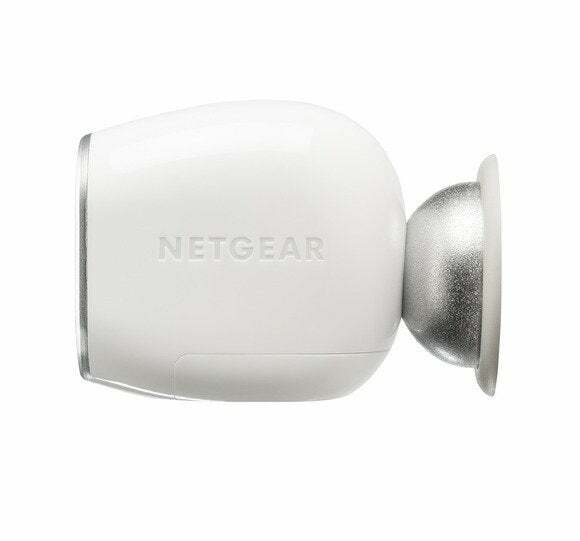 Netgear's Arlo security camera attaches to its mount via a strong magnet. Both cameras operate on your 2.4GHz 802.11n Wi-Fi network, but Arlo also requires a base station that’s hardwired to your router (Homeboy establishes a wireless connection directly to your router). The Arlo base station has a CPU and some memory and will be able to talk to other smart devices on your network. Netgear has partnered with LiFX, which manufactures radio-enabled LED light bulbs, and it has joined the AllSeen Alliance, a consortium dedicated to advancing the Internet of Things market. Other members of the consortium include Microsoft, Cisco, and iControl Networks. 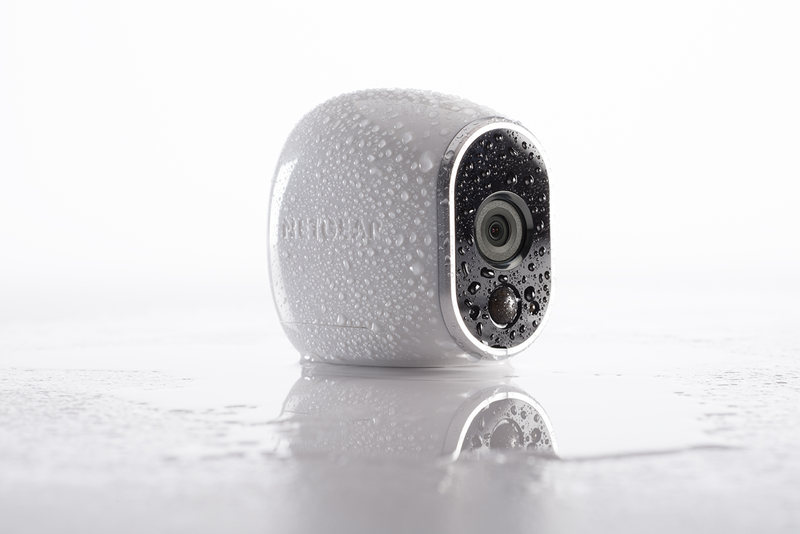 Unlike Homeboy, Arlo’s cameras feature weatherized enclosures, so they can be installed in outdoor locations as well as inside your home. Volkert described them as a “shell within a shell” design, with an IP X5 rating, which is more than adequate to protect them from dew and rain. IP ratings are an international standard for measuring an electrical device’s resistance to dust and water intrusion. Like the Homeboy, Arlo camera mounts attach to a hard surface with screws (or an adhesive strip), and the cameras attach to the mounts via magnets. The cameras also have standard thread mounts if you want a more permanent solution, such as when you’re deploying them outdoors. In either configuration, Volkert said you can replace the camera’s Lithium CR123A battery without needing to remove the camera from the mount (he said a battery should last from 4 to 6 months). An Arlo Smart Home Security Camera Kit ($350) includes the base station and two weatherized cameras with motion sensors and infrared LED night vision. Netgear also provides 200MB of free cloud storage for videos (when you hit the maximum, the oldest clips are deleted first). Netgear will have free apps for managing the cameras and viewing their video feeds on Android or iOS smartphones or tablets. You can also access the cameras and storage from a web browser. Each base station can support up to four cameras, and Netgear will sell stand-alone cameras for $170 each. The cameras will not function in the absence of a base station. New and established companies alike are seeing a spike in consumer interest in the smart home. That’s why we’re seeing so many crowd-funding campaigns and new product announcements far ahead of the products’ availability. If you can’t ship a product today, your best strategy is to convince consumers to put off buying decisions until you can. Is Arlo worth waiting for? I like the features Netgear promises, but I just can’t answer that question based on a presentation and a phone call. Stay tuned for a hands-on review.